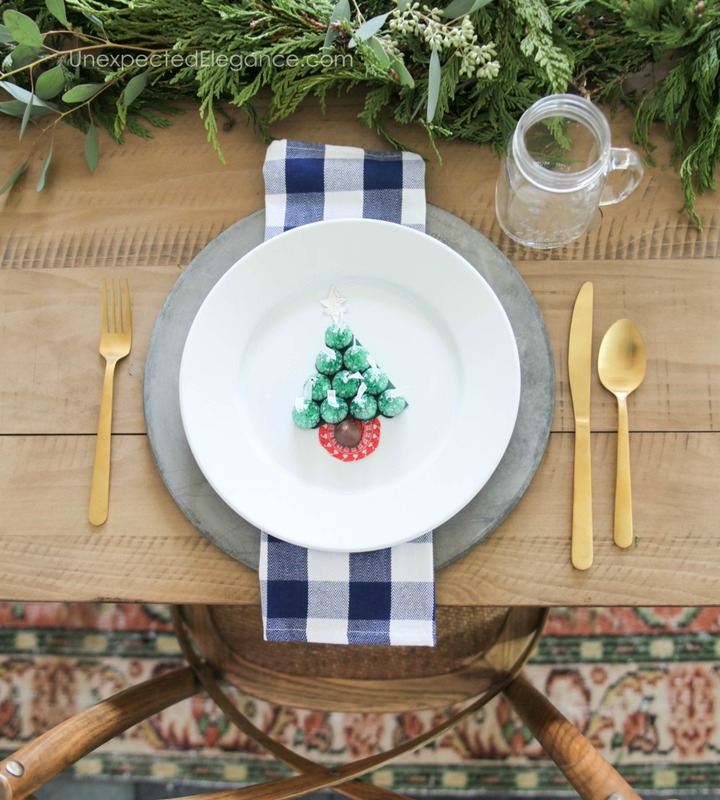 If you have kids, this Christmas Table Craft is such a fun place setting. It’s perfect for adding a simple and festive addition to your meal! Christmas is just around the corner! Have you started thinking ahead to Christmas dinner? 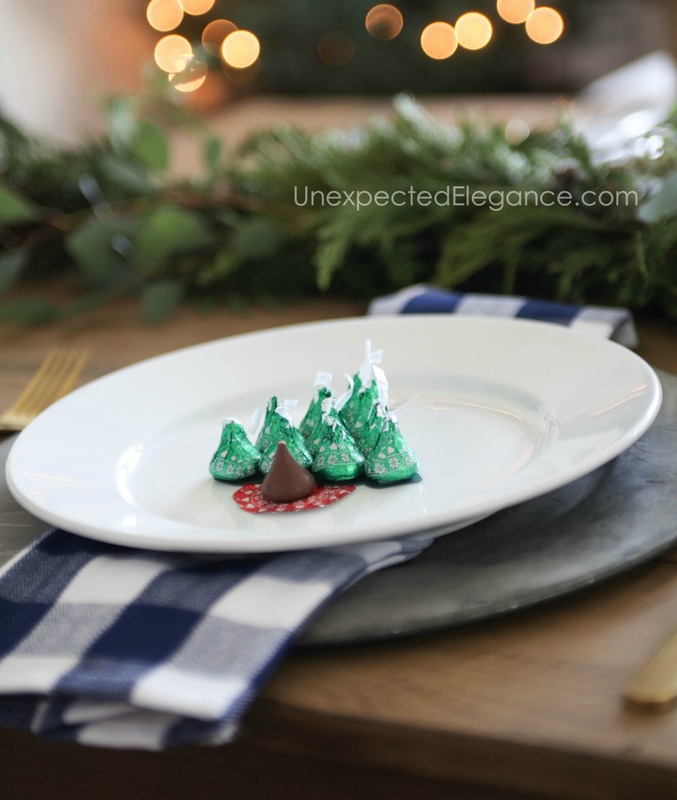 I created this simple Christmas table craft in just a few minutes and they are so easy that even the kids can help make them! This post brought to you by The Hershey Company. The content and opinions expressed below are that of Unexpected Elegance. **Disclaimer: Completed craft is for decorative purposes only, please do not eat candy included in the craft. 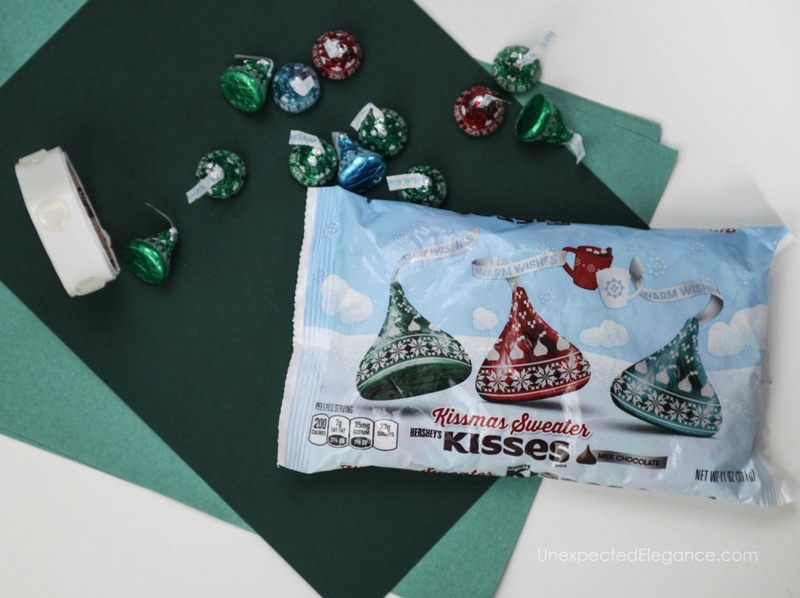 Aren’t these Kissmas Sweater themed Hershey’s Kisses so cute? 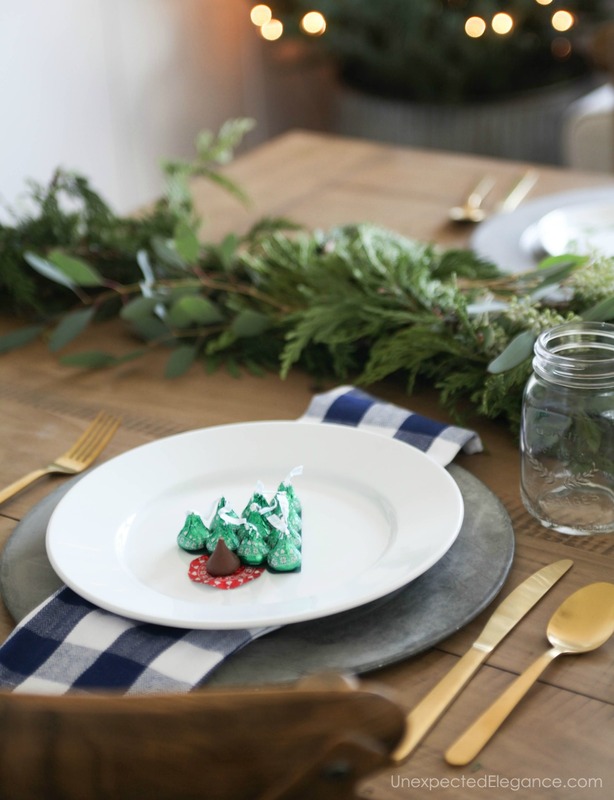 The Hershey Company continues to create ways to make the season more festive by using inspired takes on their timeless classics. 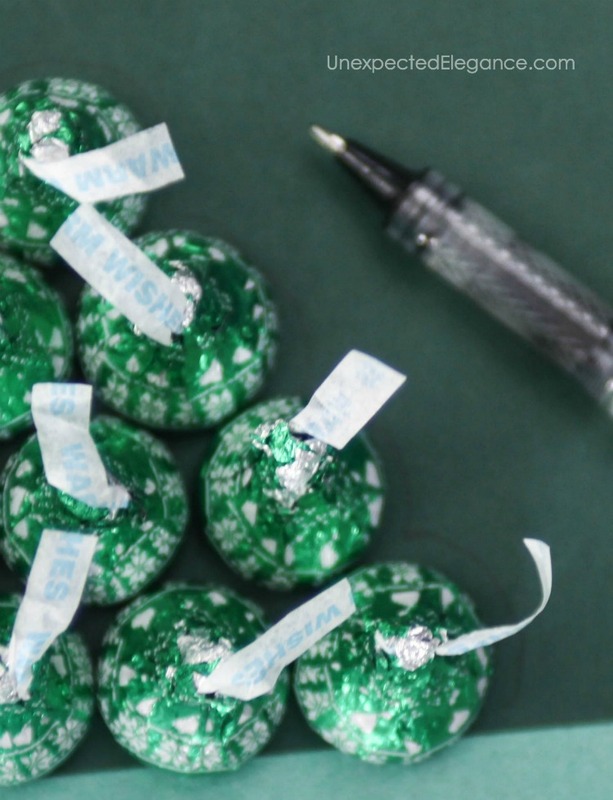 Pull out all of the green Hershey’s Kisses Chocolates and set them on top of the green paper in a tree pattern. I used 4 on the bottom, stacking them to one on top, for a total of 10 per tree. Then trace around the candy and cut out a template. 3. 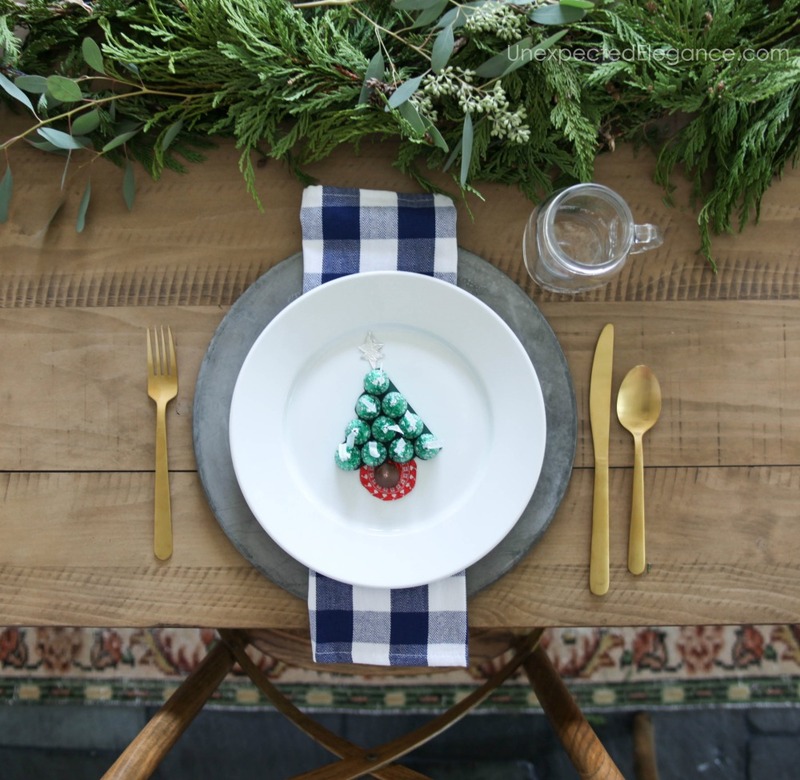 Once you have a template, cut out one per place setting. 4. 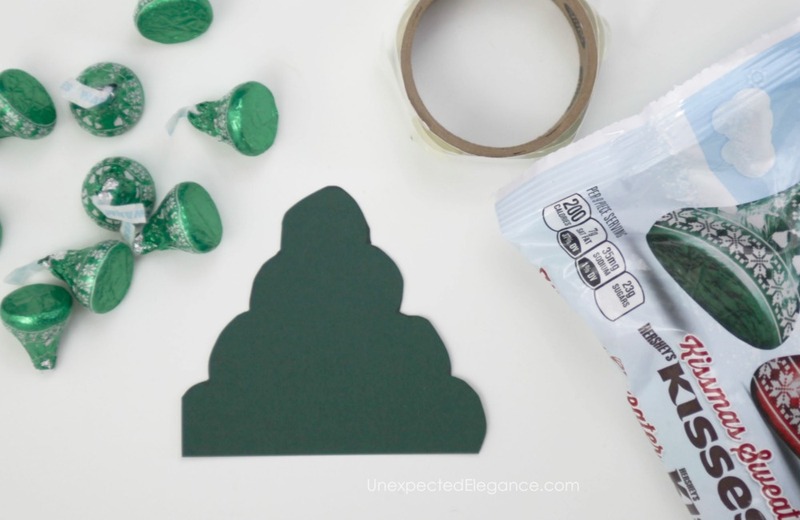 Then add a glue dot to the bottom of each Hershey’s Kisses Chocolate and attach it to the cutout. You can either use it “as is” or add a star and tree skirt. 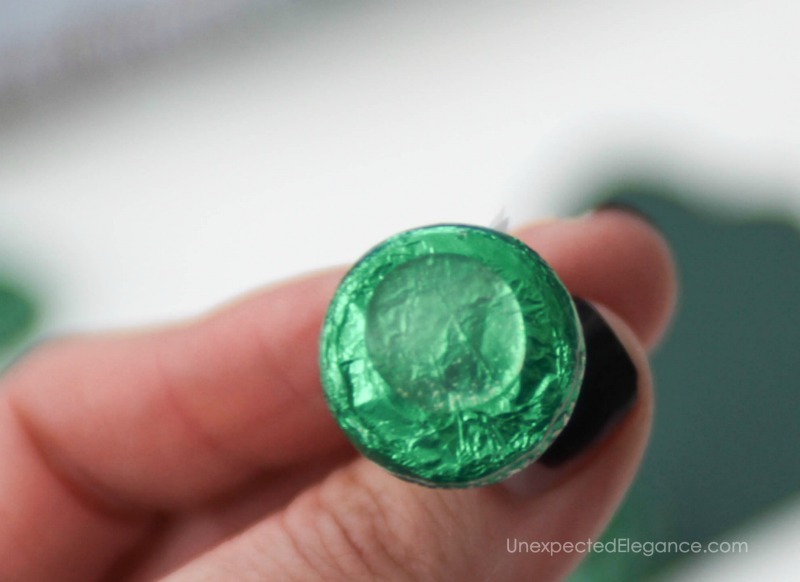 For the star, you can either use the under side of a wrapper or a piece of tin foil. Just cut it into a star shape and place it at the top of the tree. 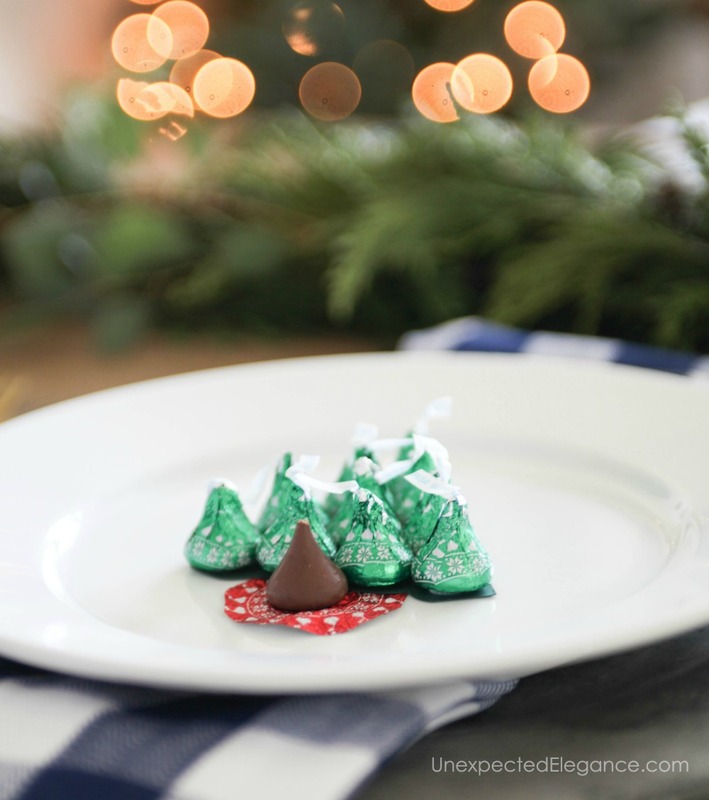 For the tree skirt of this Christmas table craft, carefully unwrap a red Hershey’s Kisses Chocolates and cut around the pattern. 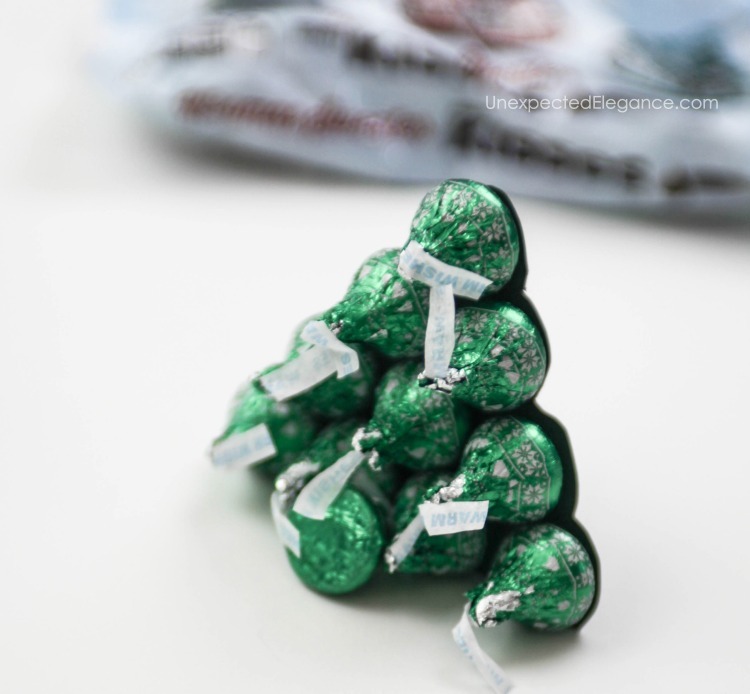 Put it at the bottom of the tree and add the opened Hershey’s Kisses Chocolate on top. Whether you’re throwing an ugly sweater bash or snuggled on the couch watching a move, a bowl of Hershey’s Kisses Kissmas Sweater Chocolates are sure to put a smile on your face. The Hershey Company’s seasonal products are sold exclusively at Walmart and are must-haves for your holiday occasions. These candies always make me think of my Memaw. She used to have, what she called a “silver bell,” as her dessert after dinner most nights and I get a little nostalgic when I see them! Tip: You could also turn these into present toppers. Just make sure to leave the “trunk” wrapped!! 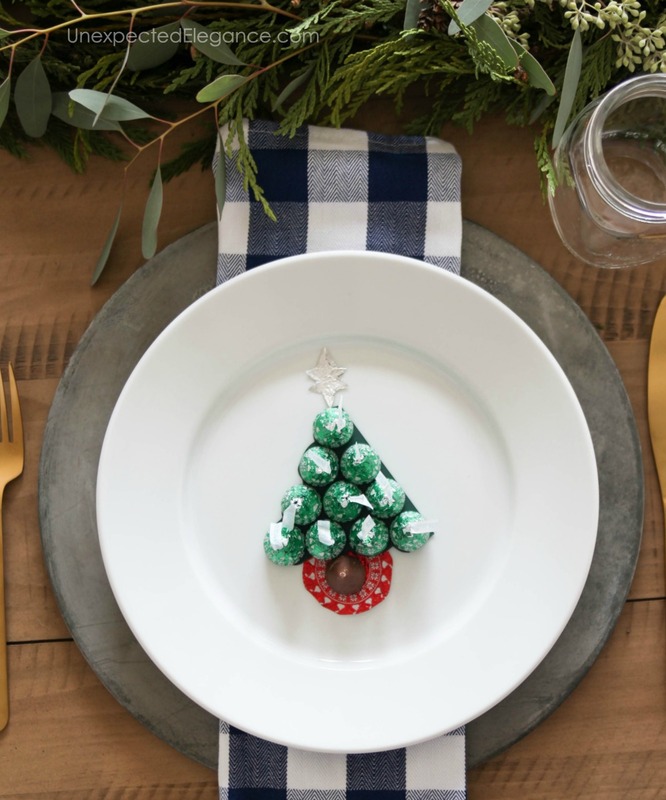 Be sure to check out the Celebrate with Hershey’s website for more great holiday craft and food ideas.